Quick look into the online account planner/manager! 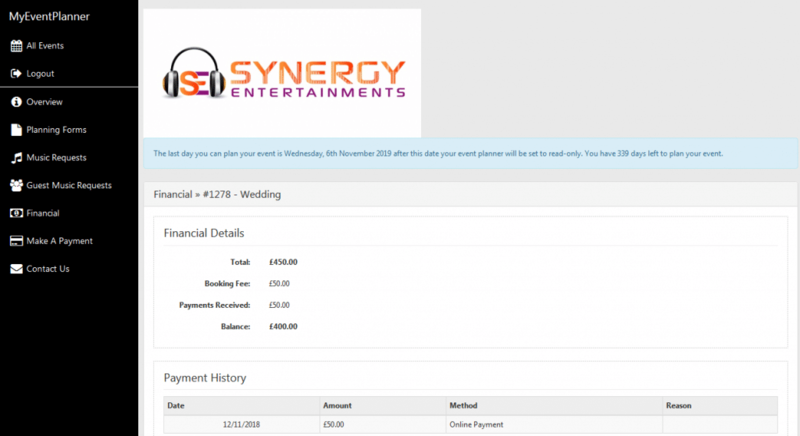 So you’ve looked over the 100’s of other DJ’s in the area and decided to book Synergy Entertainments for your wedding or event…. so what next? So I’m a simple man, and I like to keep it simple for my clients to, nothing worse than a over processed process is there? 2/ you will receive an email to a link to check over the booking contract, once you are happy with all the legal stuff you will digitally sign the document. 3/ on signing the contract, you will receive via email all your log in details to your new online account – this is where you can make those all important music requests, also you can fill out the planning forms so we have a good understanding of what the timeline is and who everybody is! 4/ Once you have made your first non – refundable booking fee payment online (totally secure) you will see payments deducted in real time. this shows the balnce left to pay…. you can make payments as and when you want up-to 2 weeks prior to the event. Our clients love this as they can spread the cost over months, instead of finding the money all at once! It is so easy, even I can use it! !